Starting a journey in martial arts as a young adult can have a number of benefits. Apart from being able to make you healthier and fitter, it can even instil a sense of achievement and confidence as you earn the various belts. Signing up for a class of martial arts, grappling or kickboxing is a terrific way for people looking to lead a healthier life to start. Plus, this physical activity is terrific for kids since it isn’t just exercise, but it’s also exciting and fun. An important part of training is related to diet and lifestyle habits, so children will most probably adopt these habits later on in their life, too. Martial arts provides a complete aerobic workout which makes use of all the muscles in your body. This helps improve a person’s health increasing flexibility, strength, muscle tone, balance, and stamina. These training programs include respecting values, goal setting, and positive encouragement which helps increase self-confidence over time. This provides extra qualities that can come in handy in a number of situations which would otherwise take you outside your comfort zone. Regular sessions can help improve your cardiovascular health, preventing a number of issues that can be near-fatal or deadly at a later stage in life. 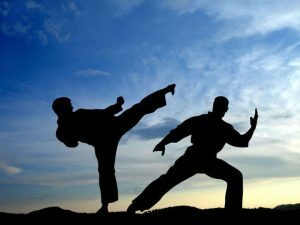 Martial arts have the potential to help with weight loss, with just one 60 minute session helping you to burn as much as 500 calories. Practicing such activities can also help in improving your reflexes which isn’t just useful in increasing your ability to perform an activity, but also improves your reaction times during various everyday activities such as driving. Research shows those involved in exercise regularly find it easier to improve their mood. Martial arts can really come in handy when it comes to relieving stress and frustration.